But what does one of those 2,500 scientists say? Dr. Kevin Trenberth of the National Center for Atmospheric Research in Boulder, Colo., is a leading advocate of human-caused global warming. I last encountered Kevin at an American Meteorological Society meeting in Denver in summer, 2008. He was adamant that global warming was occurring and a real threat to humanity. Less than two months ago, Dr. Trenberth participated in a written debate with Dr. Bill Gray of Colorado State University (a global warming skeptic). Dr. Trenberth wrote, "warming of the climate system is unequivocal" and "global temperatures [have] especially warmed since the mid-70's." 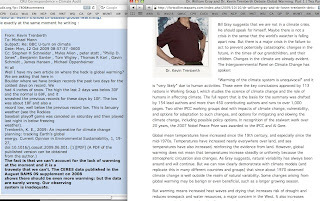 But, what did a Climategate email show Dr. Trenberth writing two days later? I'd call that a "smoking gun." Glenn Reynold's of the wonderful Instapundit blog says, "I'll believe global warming is a crisis when the people telling me it's a crisis start acting like it's a crisis." Given the number of private jets carrying people to Copenhagen, one wonders how many of the delegates really believe global warming is the dire, immediate crisis they keep preaching to the rest of us.